I want to give some perspective on SAFe and the training that I have been attending these last few days. The training itself is not actually over, but we are very near the end. Just one day left, but it is dominated by the SPC exam and open Q&A on advanced topics. In other words, we have covered the essence of SAFe. When I think about organizations or departments trying to become Agile enterprises, I generally categorize those efforts into three approaches. The “Ad Hoc” approach is typified by a grassroots movement or an executive decreeing “be Agile” with no one really knowing what that means. A lot of organizations have some teams in this condition – they try Scrum, try some other Agile-ish things, and have modest successes. When the enterprise is large enough, these ad hoc approaches reach a natural limit of effectiveness before they become severely blocked by organizational considerations. Then, the leadership of the organization must turn to systematic approaches to becoming an Agile enterprise: the Pragmatic approaches or the Transformative approaches. The “Pragmatic” approach acknowledges the difficulty of change, particularly for those in middle management. There is still a deep acknowledgement of the Agile values and principles, but the pragmatic part is to say that the organization will take quite a long time to adopt those values and principles end-to-end, top-to-bottom. These pragmatic approaches typically have low risk and good results. SAFe (Scaled Agile Framework) falls into this category along with DAD (Disciplined Agile Delivery) and possibly others that I’m not aware of. The “Transformative” approach acknowledges the deep nature of Agile as a cultural transformation that can be done quickly when there is urgency to do so. 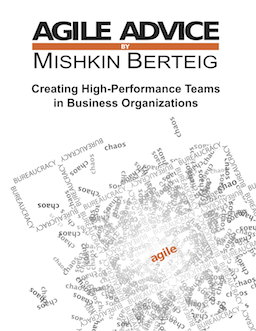 There is still an acknowledgement that Agile can be difficult for many people as it requires a change in mindset and deep habitual behaviours. These approaches are transformative because they require all protagonists in the enterprise to be open to this deep and fast change to a new culture. LeSS (Large Scale Scrum) and RAP (Real Agility Program) are both systematic transformative frameworks. SAFe, as a pragmatic approach, has a number of excellent features that will help an organization accomplish its business and technology goals. Clear examples of SAFe implementations making choices based on the values and principles of the Agile Manifesto. It was common to talk about situations where SAFe ScrumXP teams, Agile Release Trains and the people involved made decisions based on “individuals and interactions”. Practices and guidelines that implement the values and principles of Agile are pervasive throughout SAFe. The Inspect and Adapt meeting, Program Increments, daily business collaboration with SAFe ScrumXP teams, customer collaboration through various forms of backlogs, reviews and demos, focus on simplicity and technical excellence with Architectural Runway, Test-Driven Development and other Agile engineering practices. The instructors (not just Mr. Leffingwell) often mentioned their own philosophy of being flexible with the SAFe “framework” by making appropriate context-specific changes to the details. Even participants in the class who have already started using SAFe in their organizations shared stories that clearly indicated a strong emphasis on the values and principles of Agility. At the same time, SAFe manages to create a relatively simple interface with a traditional management organization. This is critical and what makes it really effective as a pragmatic approach to enterprise agility. For example, at the Agile Release Train level, there are nine roles identified (e.g. System Architect, Product Management, Business Owners). The explicit acknowledgement and identification of these roles and how they interact with the SAFe ScrumXP teams through meetings, artifacts and other processes and tools helps an organization to map Agility at the staff level to traditional concepts at the middle-management level. This interfacing is also pervasive throughout the SAFe framework and occurs at all levels of effort from individual team members up to high level business leaders. Some people have grumbled about the complicated diagram as “proof” that SAFe can’t be Agile. But a different way of looking at the diagram is that it is comfort for management. I really appreciate this. Back in 2004 and 2005 when I was consulting at Capital One on their first enterprise attempt at Agile, one of the coaches I was working with shared a story with me about the importance of comfort. The project manager for an important project was very nervous that there was no Gantt chart in Agile. At a personal level, she needed the comfort of having a Gantt chart to track the work of the team. The coach for this project told the project manager “please, make your Gantt chart – just make sure that you let the team organize themselves without being disturbed to help you with the Gantt chart.” Most Agilists are anti-Gantt. This was a real eye-opener for me. That project manager went on to gain confidence in the Agile team and was able to eventually discard the Gantt chart. SAFe isn’t just a framework, it’s actually a scaffolding. When you build an arch, you need a scaffold to keep everything in place until the keystone is in place. In creating an Agile enterprise, you use SAFe as a scaffold to get you to Agility. I like this list. I might change the wording slightly, but in going through the details of what these mean, it is clear that if leaders could adopt these principles, every organization would be a much better place to work. There is a fair amount of time spent on helping leaders make the shift in thinking from traditional “scientific management” to “Agile leadership”. There are a lot of good reading references given in these discussions including “Five Dysfunctions of a Team”. There is also a lot of time spent on value stream thinking including some great discussion exercises. SAFe does not define all the structures throughout the whole organization. By design, it is not end-to-end, top-to-bottom. It does define a structure for three levels of activity: the team level, the program level and the portfolio level. At the team level, SAFe relies on a slightly modified version of Scrum and Extreme Programming (XP) that it calls SAFe ScrumXP. As a Certified Scrum Trainer, I’m confident that the Scrum described is “good enough” to be legitimate Scrum even if there are small variations. One example is in the idea of commitment. Scrum espouses the value of Commitment. In “old” versions of Scrum, the Scrum Team was required to commit to the work of the Sprint (the business scope). SAFe keeps this concept. However, if you look in the most recent version of the Scrum Guide, this concept is no longer present. One thing that I think is absolutely fantastic is that several of the XP technical practices are required practices in SAFe: Test Driven Development, Continuous Integration, Pair Programming, User Stories, Acceptance Test Automation and Refactoring. I wish that Scrum would get around to officially requiring these practices. This set of canned answers is sometimes an irritant for Scrum folks, but the fact is that, again, middle managers are often made more comfortable by being provided with concrete answers. And, in my not-so-humble opinion, SAFe is providing the right answers. Since all this is at the Team level, middle managers are even more comfortable because they can tell all these staff-level people how to work. At the program level, SAFe scales the basic concept of a Sprint up to a larger “Program Increment” (PI) concept. The core concept that holds the program level together is the Agile Release Train which is based on a limit to the number of people who can work effectively in a social network (Dunbar’s number ? 150). Again, SAFe is quite definitive about process at this level: Sprints are 2 weeks long and PIs are 5 Sprints long (10 weeks). Timeboxing is explained effectively with the concepts of cadence and synchronization as a way to ensure predictability at the program level. Unlike the simplicity of the Team level, the Program level in SAFe introduces a number of important connectors to transitional organizations. This is done through defining several roles that have extremely close analogues to traditional roles (and even use a lot of the same names), and through other artifacts such as vision, roadmap, non-functional requirements, and features. There are even a number of recommended metrics for evaluating the performance of the program (not the people). At the Portfolio level, SAFe simplifies again somewhat in that there are no new aspects of cadence or synchronization introduced, and the number of defined roles and artifacts at this level is relatively small. One important difference at this level compared to the Program and Team levels is the introduction of a Kanban approach used to feed “Program Epics” to the Agile Release Trains at the Program level. At this level, Kanban is used to drive the flow of value, but there is not as much emphasis on continuous improvement here (although there is when SAFe discusses leadership). At all three levels, there is a constant emphasis on the lean concept of focusing on value rather than cost. This comes in many of the details, but may be a bit difficult for middle managers. Fortunately, the Portfolio level includes some excellent advice on working with budgets and allocating those budgets to business vs. technical needs and based on the effort required at the Program level with the Agile Release Trains. SAFe recommends revisiting budgets every six months (I believe this is meant to be every 2 Product Increments) and is the only aspect of cadence and synchronization at the Portfolio level. I’ll admit that overall I didn’t particularly enjoy the training. I love SAFe. As a trainer myself, I’m too critical perhaps. Certainly, the training I deliver has evolved over ten years of work with lots and lots of feedback and mentorship. However, in the Agile community, the overall standard for training has improved greatly over the last 5 years and I would love to see our three trainers who helped with this course improve their delivery. There are a also some general comments about the training that I would like to make that are about personal preference. First, I would prefer more small exercises that are experiential. For example, there was a great deal of time spent on centralized vs. decentralized decision-making and leadership which could have been compressed greatly with a simple exercise like the “Command and Control Walking Simulation” which takes about 5 minutes to drive home the point unequivocally. The first two days were largely lecture with a couple big exercises (both the lecture and the big exercises were generally good). Second, the slides. The slides. The slides. The slides… and more slides!!! Too much by far. And using the slides for lecture made it very difficult to stay on track for time with lots of slides missed or touched on only very briefly. This is anxiety-inducing and boredom-inducing for me. Some people like lots of slides, but most people don’t. Third, not enough breaks for a 9 to 6 training session. Usually just one break in the morning and one in the afternoon as well as a short lunch. Two breaks and a longer lunch would have made it much more tolerable from a personal comfort level. At one point on the third day I just had to take an extra break and I ended up missing about 30 minutes before I felt ready to come back. I’m happy I invested in this for both myself and for Travis. We have learned a lot about SAFe, a little about Agile and Lean, and we are both excited about offering SAFe-related services to some of our clients. At this point I am convinced that it is appropriate and good under some common (but not universal) conditions. I will probably write several more articles about SAFe as I process the information and start to relate it to more specific aspects of Agile, Lean, organizations, management, leadership, productivity, and, of course, our own Agile Enterprise framework, the Real Agility Program. I’m excited and happy to see that the two frameworks are not competitive or exclusive in any significant way… more about that of course! First, I did a conference telecast today. You can download the recording of the talk “Recession Proof Your Business with Agile Management“. Second, Esther Derby has written a good article about what management needs to do to have a successful agile implementation.